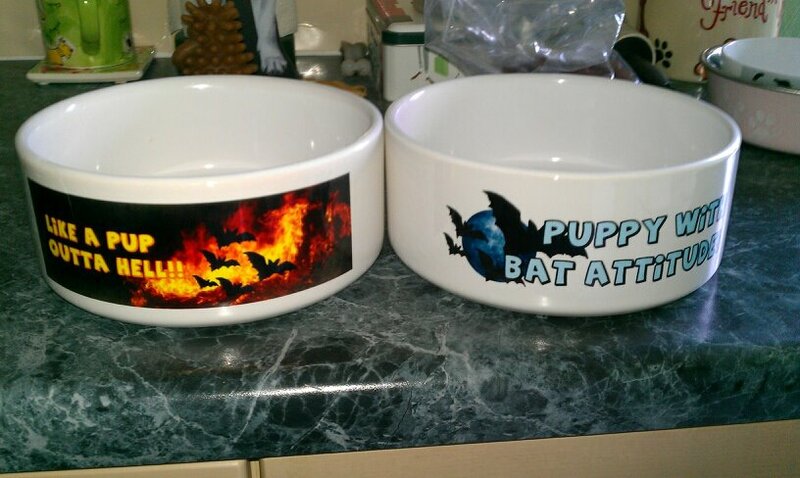 Dog bowls, which i think are fab ! Gonna try and get some more pics with TJ my JRT in as well, last pic wasn't as good cos he was eating like a Bat Outta Hell ! Well done all involved with the charity. I am awaiting the necklace as well, sounds like it might be something special ! I bought a pendant necklace yesterday. Can't wait to get it!!!!! Meanwhile our new design of band will be coming as Meat starts to rock Australia!! Thanks Caryl, i am still trying on getting a better pic of them both eating their dinner ! Whilst up norf look what I found on someone's wrist!!!! That wrist looks really familiar, Monstro. I think it is a great way to show support for a charity close to Meats heart, as well as the money from the wristband going to said charity. 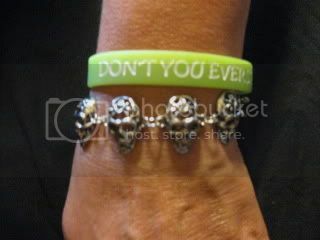 Buy a wristband, they are pretty cool, glow in the dark, my neices loved theirs ! check out the cool new t-shirts and pjs ! I have just ordered 2 t-shirts and some pjs, awesome styles, money going to the Painted Turtle ! 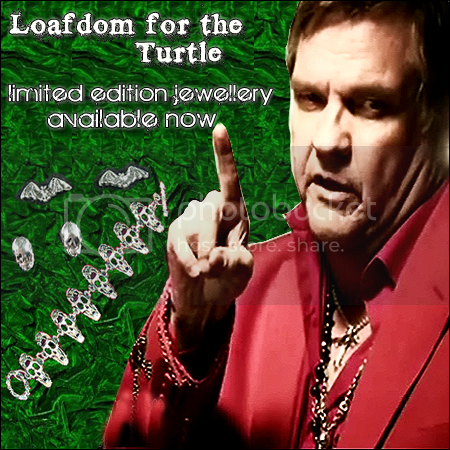 Christmas will be hear soon, buy one for a friend or for yourself for Christmas. I love the skull designs and angel ones too, Rock Til You Drop ! Thanks Michelle .. and thank you for all the ideas and enthusiasm .. it means so much We could do with more like you .. The CafePress shirts etc aren't cheap, but they're really good quality, wash time after time really well, and are worth the money I think. We're still a long way from achieving our target of meeting the cost of one week at camp for a child every month .. 12 young and special lives transformed at this amazing facility every year thanks to Meat's fans, but it's early days. Hopefully Meat' s support of what we're doing by putting the link to our site on hs FB page immediately under the link to his official site, will help us reach out to a wider fanbase and also encourage those who haven't bought a $5 band yet to start collecting We have a new band coming on line as soon as stocks arrive, which should be any day now. 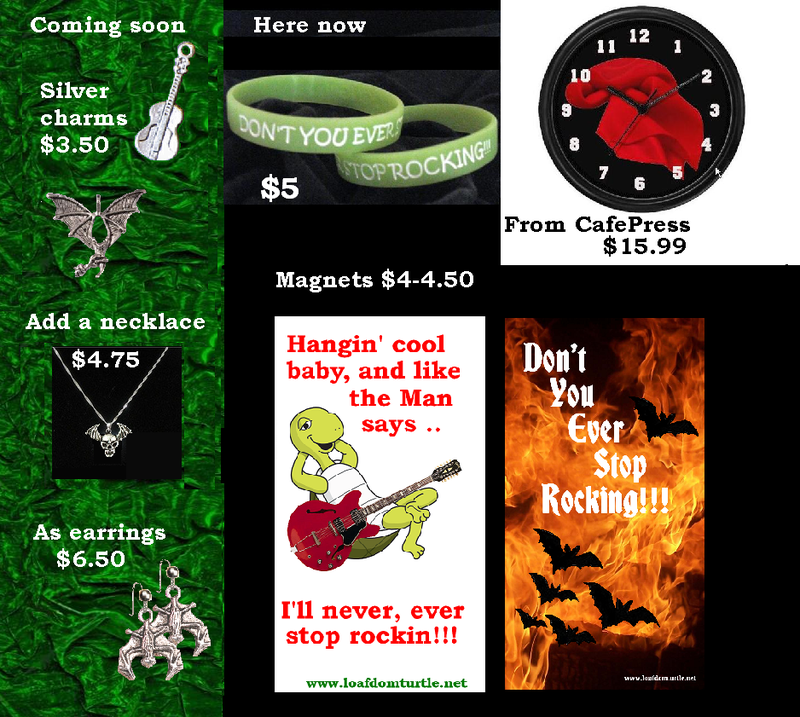 And we've launched fridge magnets which can be purchased from our site from $4-4.50, post included, thanks to a suggestion by SuieQ. The t-shirts may not be cheap, but they are unusual and great designs, can't wait for mine to arrive. No doubt i will be getting more ! Thanks Caryl, i am happy to support a worthy charity and put a little time into helping anyway i can. I hope more people will check out the site and see there are some great items for sale. Our full range will follow next month, but today our Limted Edition is on sale. These are a one-time offer, and when they're gone, they're gone. We don't know if we'll be able to get them back again, so don't delay. And rmember, we're offering a fixed shipping price on our jewellery orders; $1.10 in the UK and just $3 Overseas, and that's for your order, not each item .. Thank you. All 3 just ordered. Thanks Chris They'll be on their way in tomorrow's post! That's find Caryl. I really love the jewerly. The necklaces and matching bracelets are wonderful. Thank you all who are involved with this. It's fantastic. I also have bought a skull bracelet, which is awesome, great quality ! Thanks .. I think they're pretty special. SO Meat .. and really impressive quality; they weigh 40g, and the detail is fantastic. Caryl can you bring me two of these on the next uk tour, please? I just posted the picture above of my skull bracelet. You are going to be so PLEASED!! Thank you for your continuing support. Spreading the word wherever you can about what we're trying to accomplish on behalf of the kids served by The Painted Turtle will be invaluable. Again, thank YOU! Great t-shirt, fantastic quality, check it out ! WOW that looks great. Can't wait for mine. I also got the bracelets and matching necklaces. Making them into a picture. 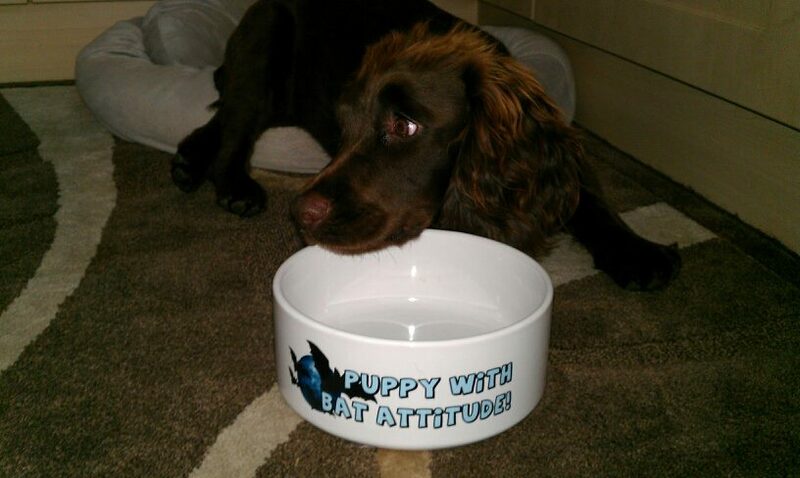 I'm gonna order the doggy t-shirts. My youngest is always cold. Page generated in 0.08261 seconds with 14 queries.